I enjoyed doing something nifty yesterday. I offered a keynote address to a small conference in Saskatoon, Saskatchewan ... via the internet. Once we got the technology to settle down and behave, it went well and was virtually well-received. I went to bed the the night before this presentation still not quite knowing how to structure my talk. The audience was filled with teachers participating in a program called Little Green Thumbs (LGT), an indoor school gardening program available in a handful of Canadian provinces (though I know they'd like to expand within North America; contact LGT here to find out more about becoming a host organization). I knew that I wanted to talk to these teachers about climate change, and about the important role they're playing in preparing children for the future we're bequeathing them. But I couldn't quite put my finger on a unifying theme for my talk. 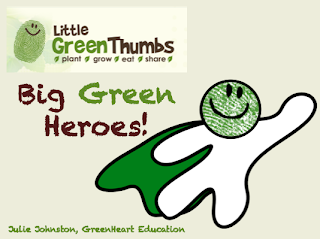 Just as I was drifting off, it came to me: Little Green Thumbs, Big Green Heroes. My subconscious then got me up at 4 am to make sure I was ready for my 12 noon presentation, and I had some fun creating that little green-caped superhero as my motif (with thanks to clipart and the LGT green thumb). I began my talk asking why we all chose to become teachers. Perhaps it's because we love children, or we love our subject area. Maybe we loved school when we were kids, or we simply love to teach, period. No matter what the reason, we probably didn't become teachers because we wanted to be heroes. And yet, any educator who is teaching food growing skills to today's children has become a hero, even if inadvertently. Teachers now shoulder much of the responsibility for preparing children for their climate-changed and carbon-constrained future. It's a responsibility we're not facing, however. Our teaching, from now on, has to be imbued with both compassion and courage ... compassion for our students and their future, and the courage to acknowledge the climate change emergency and that it demands changes in what and how we teach. Needless to say, the children in Little Green Thumb programs are going to be the food security leaders and heroes of their generation. As I've noted here before, we can't grow food overnight; nor can we learn to grow food overnight. Grown-up Green Thumbs will be the ones ready to take on the food-growing challenges presented by chaotic weather events and changing climatic patterns. So here's a salute to the educators — the big green heroes — who recognize the value of teaching "agriculture in the classroom" and who are passing on the vital skills of soil building and food growing. The Compassion Games Start Soon!